AS IT STANDS: Remember the 47% You Dissed Last Time Romney? They’re Still Out There! Remember the 47% You Dissed Last Time Romney? They’re Still Out There! There’s certain things people don’t forget when it comes to being insulted. American voters aren’t likely to forgive Mitt Romney’s comments in the last election for several reasons. Who can forget Romney’s famous 47% gaffe that even he said “did real damage” to his campaign? Thanks to the magazine, Mother Jones Americans got a candid peak of Mitt’s real feelings about segments of Americans. Romney’s revealing gaffes like “I like being able to fire people who provide services to me.” still won’t endear him to anyone. Another memorable one-liner, “Corporations are people, my friend” Mitt said during a question-and-answer session at the Iowa State Fair in 2011. It was an unscripted moment after people urged him to raise taxes on the wealthy and corporations to help fund social welfare programs followed by days’ worth of headlines. 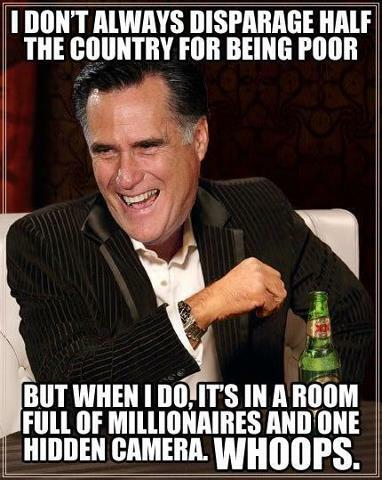 What really amazes me about Romney’s possible third bid for the presidency is he (and his handlers?) must think Americans have short memories. I read where Mitt is going to “re-tool his campaign” this time around. Unless there’s a sudden case of national amnesia, Mitt and his minions are going to experience the same rejection as the last election. Great news for coffee drinkers – check it out!